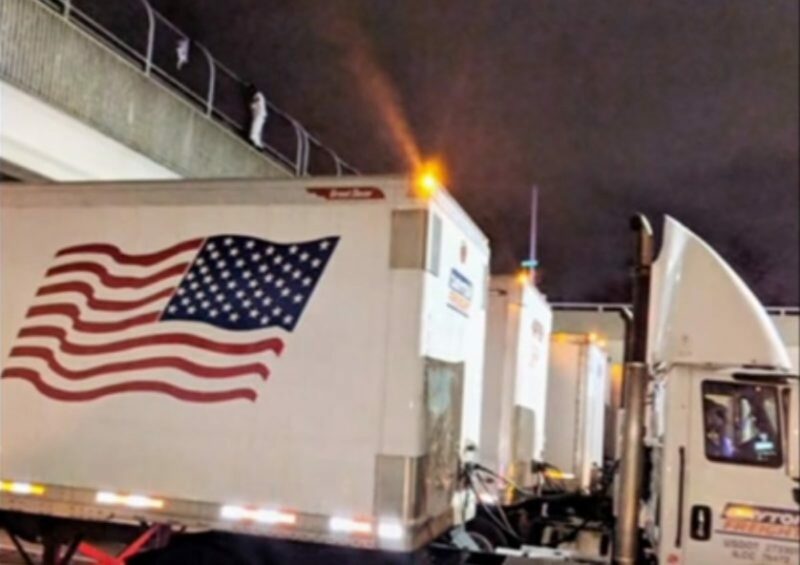 It was an unusual sight, when the road users on the Interstate 696 in Detroit Michigan, saw thirteen truck drivers park their trucks under a bridge, blocking traffic going in both directions of the highway, stopping others from plying the road. The truth of the matter is that the trucks didn’t block the road mindlessly without a good reason. They did what they did for a just, incredible and selfless reason. It all started, when the police force in Detroit received a distress call about a man contemplating suicide, he was threatening to jump off an overpass between Interstate 696. A lot of local law enforcement agencies rushed to the troubled scene with a couple of negotiators, to convince the man to abort his suicide mission. According to CBS News, the Michigan State Police (MSP) came up with an amazing plan to help solve the problem. The plan was to use trucks to create a “safety net” under the underpass. In the wee hours of a Tuesday morning, Lt. Michael Shaw of the Michigan State Police, found himself in a tight spot, one in which he needed the public’s help to salvage a situation. Fortunately for him and the man on the suicide mission, Lt. Shaw got the exact help he needed, confident and selfless drivers who could brave the storm with him. ABC News reported that as soon as the officers got to the scene, some of them focused on the man, talking to him calmly, while the others took to the highway, flagging down truck drivers and organizing them into a row beneath the bridge. So as to reduce the distance between the man and the landing spot, peradventure the man decided to jump eventually. According to Lt. Shaw, the trucks were parked together in a tight position, so that there wouldn’t be room for the man to fall on the ground if he jumped the overpass. It was reported that the trucks were under the overpass for about four hours until the man was gotten off the bridge and escorted to a nearby hospital by the police. The man later explained that he was having issues with his family. MSP Metro Detroit later shared an image of the act of heroism on Twitter. The picture spoke volumes, as it showed how strangers stood up to save just one person they don’t even know. It showed the police officers doing their jobs with the help of patriotic citizens who would rather save a life than be in bed at that hour. Beside the image, was a plea for people to speak out and ask for help, any time they are faced with situations beyond their powers, because there are people who really care about, like the thirteen truck driver who cared for that man on the bridge.